But when I consistently heard my favorite podcaster rave about something called “bulletproof coffee” as if it were a magical health elixir, I became increasingly curious about its true nutritional value. Hey, I love coffee and I love having energy—something this beverage claims to give in high doses—so I figured I’d give it a shot. I’ve now been drinking bulletproof coffee regularly for a month and what I’ve learned is, no, it’s not a magical health elixir. But it is delicious, fat-burning, energy-giving and straight up fun to make! So I wanted to share my experience in hopes that it might inspire you to give it a try and see if it works for you. Keep reading for my take on bulletproof coffee! First things first: What is bulletproof coffee? It’s a blend of coffee, butter (or ghee, if you’re dairy-sensitive) and MCT oil (not coconut oil, which is important to note). While the term “bulletproof coffee” originated from the brand Bulletproof, which sells its own branded coffee beans, MCT oil (what they call Brain Octane Oil) and butter, it’s now a catchall term to describe coffee made with those three key ingredients. When you’re finished blending, you’re left with a foamy, frothy and creamy cup of coffee that almost looks like a latte! What Does Bulletproof Coffee Do? Before we dive deeper into the ingredients that make up bulletproof coffee, let’s dive into why people drink it. If you’re anything like me, you might be wondering why anyone would 1) put their coffee in a blender and 2) associate coffee and butter, in any way whatsoever. But trust me, the two pair better together than you might think! Okay, now let’s talk about the individual ingredients. I had never heard of MCT oil until I learned about bulletproof coffee. But now that I have, I’m noticing it’s popping up everywhere! So what exactly is this stuff? MCT is a saturated fat that stands for medium-chain triglycerides. Most dietary fats you consume are considered long-chain triglycerides and have to go through a series of chemical reactions in order to be turned into a usable source of energy. But because MCTs are shorter chains, they do not need to be broken down into smaller molecules and are readily available to be used as energy. Due to its chemical structure, MCT oil is digested faster than other fats you might be consuming regularly, such as olive oil. It’s colorless, odorless and, unlike coconut oil, stays liquid at room temperature, so it’s a great alternative to add to food, salad dressings, smoothies and—of course—coffee! Now, let’s move on to the next ingredient: butter. Blending butter into your bulletproof coffee is what makes it so creamy, and while adding this ingredient initially freaked me out, I quickly realized why the end result is so popular. But you shouldn’t just use any old butter—you should always choose grass-fed butter. Why grass-fed? Because regular butter from grain-fed cows has a different fat composition that doesn’t offer the same great taste as butter from pasture-raised cows. Grass-fed butter also blends more easily, which is an essential part of any bulletproof coffee recipe. More importantly, though, cows that graze on grass produce milk that is packed with healthy fats and fat-soluble vitamins that nourish your skin, eyes, heart and brain. Grass-fed butter is also rich in conjugated linoleic acid (CLA), which has anti-inflammatory properties and helps to burn unwanted fat. If you’re dairy-sensitive or lactose-intolerant, substitute the grass-fed butter for organic, grass-fed ghee. Ghee is pure butterfat, so grass-fed ghee will have the same nutritional benefits listed above without the lactose. The only difference you should see is the consistency of the bulletproof coffee. Since ghee is more oily than butter, you won’t get the foamy top after blending. But you’ll still get the creamy consistency! I’ll admit, the thought of starting my day by drinking butter left me pretty skeptical about the true nutritional value of bulletproof coffee. Wouldn’t I be consuming too much fat? – Eating fat makes you feel more full for longer periods of time, thereby reducing your appetite. – Fat helps to keep your blood sugar levels under control by slowing the absorption of carbohydrates. And when you have a balanced blood sugar, this helps to lower inflammation and stress hormones. – High-quality fats allow your body to absorb and utilize fat-soluble vitamins, including vitamins A, D, E and K.
Okay, so if you’re intrigued, why not give bulletproof coffee a try? When you’re ready, here’s the recipe! – Pour in your favorite coffee mug and enjoy! 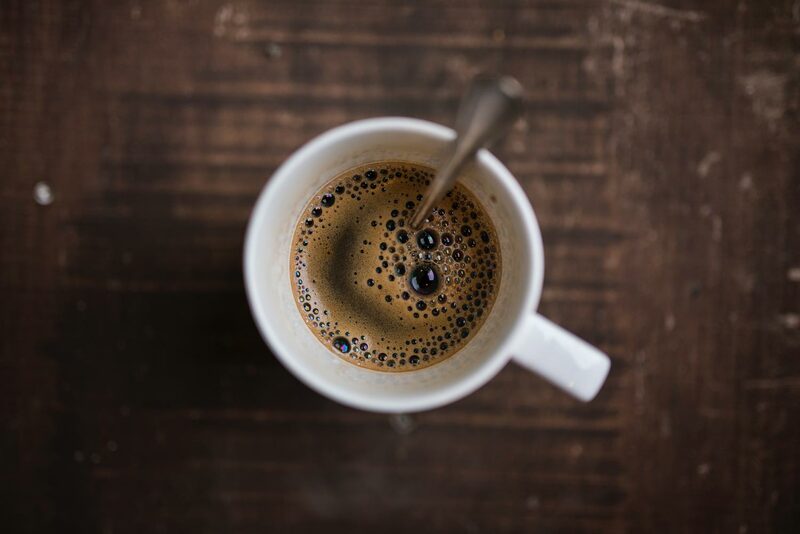 – If you’re someone who likes to sip slowly and enjoy your coffee all morning (like me), make sure you pour the bulletproof coffee into a to-go mug that will keep it warm. You don’t want it to get too cool because the butter could start to harden. And that’s just not appetizing! – If you decide that butter and MCT oil are not for you, you can try making bulletproof coffee by simply blending coffee with coconut oil! I’ve now been drinking bulletproof coffee nearly every morning for the last month, and I’ve been loving it! Not only is it delicious, but it’s actually become a nice part of my morning ritual to allocate 10 minutes before heading to work to brew and blend my coffee. Doing something just for you every morning is important! I’ve never been a big breakfast person, so it’s been extremely easy and pretty convenient for me to substitute my breakfast with bulletproof coffee. I normally make it around 7:30AM, and it keeps me full and energized for hours! I’ve found that it’s a great pre-workout beverage, too. I think the best way to figure out if bulletproof coffee works for you is to just try it and be consistent! Commit to drinking it for one to two weeks so that your body has time to adapt to burning fat for energy instead of sugar or carbohydrates. When you try it, take note of how it makes your body feel. Does it increase your energy levels and improve your focus? Or does it bother your stomach and fail to curb your hunger? Either way, it’s helpful when trying something new to track how your body is reacting to it, which can help you decide if it’s something you’d like to stick with long-term. So if you commit to trying it, let me know how you like it! We’ll swap stories. I think I may give this a try! If I go to a 6am camp, what time would you suggest having the bulletproof coffee before camp? Is it ok to drink in the afternoon? Say when you really want something sweet? Great article. I have been making my bulletproof coffee for a few months. I love the taste, texture, and YES I feel the energy from the MCT oil. I use Ghee instead of grass fed butter. I give bulletproof coffee 2 thumbs up. BTW there’s a good alternative for when you’re traveling and you don’t have a blender or all the ingredients. The name of the instant coffee is Giant Keto Coffee and I ordered it on Amazon. Where can you find MCT oil? Is a brand better than another? can we find this in a powder form already made like our protein shack for busy people. I love bulletproof coffee and drank it for several months. I ran out of MCT oil and just keep putting off getting more. It gave me all day energy too. Do you have a specific brand of MCT oil that you like to use. There are so many out there!! I tried this, and it is actually pretty good! I had to add some Stevia, because I don’t like my coffee black. I definitely need to add this to my morning routine. Sounds intriguing! Where do you recommend getting the mtc oil? What brand MCT oil did you use? Ive had plenty of bulletproof coffee my daughterinlaw used to work for corporate so we got it at cost. good stuff. I still use the brain octane and the collagen protein (add to my coffee). and I occassionally take the charcol.